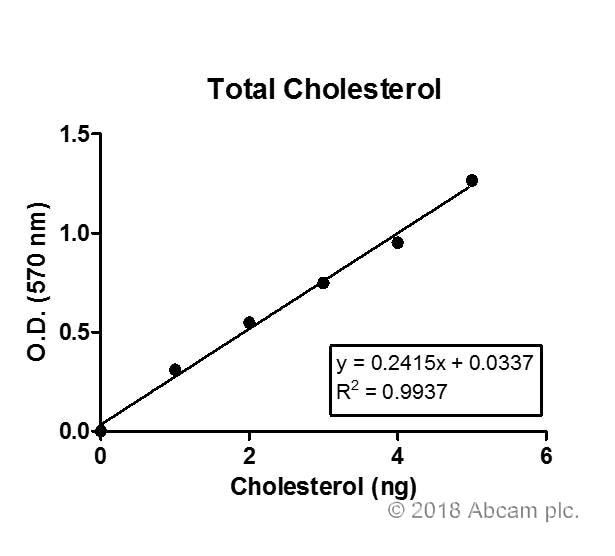 Cholesterol Assay Kit ab65390 uses a simple method to quantify total cholesterol, free cholesterol, and cholesterol esters in mammalian samples. It also includes an easy method to separate HDL and LDL / VLDL cholesterol. In the cholesterol assay protocol, cholesterol oxidase acts on free cholesterol to produce a chemical which reacts with a probe to generate color (570 nm) and fluorescence (Ex/Em = 538/587 nm). Cholesterol esterase is used to hydrolyze cholesteryl ester into free cholesterol. If cholesterol esterase is included in the assay, total cholesterol is measured. If it is not included, free cholesterol is measured. 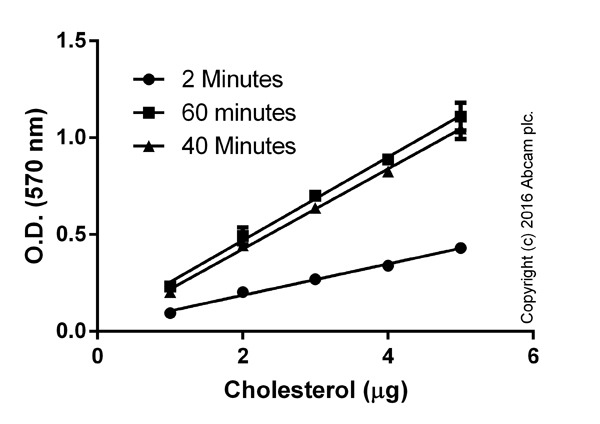 The amount of cholesterol ester can be calculated by subtracting free cholesterol from total cholesterol. If you need to purchase additional HDL precipitation buffer, please see ab105138. HDL (high-density-lipoprotein), LDL (low-density lipoprotein) and VLDL (very low-density lipoprotein) are lipoproteins that act as carrier proteins for cholesterol. The regulation of HDL-cholesterol and LDL-cholesterol plays a central role in various disease development. It is well known that low levels of HDL and high level of LDL are associated with an increased risk of cardiovascular events. Rat serum samples were processed according to the protocol. The quantity of total (dilution range 1:10-1:100), HDL (dilution range 1:1-1:10), LDL/VLDL (dilution range 1:1-1:10) and free cholesterol (neat) was measure colourimetrically, in duplicates, after 40 minutes. Signal from standard curve was measured colourimetrically over a period of time. Background signal subtracted and each point on the curve represents duplicate values (+/- SD). 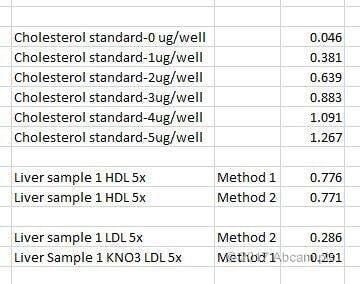 Measurement of total cholesterol, HDL, LDL/VLDL from serum samples. 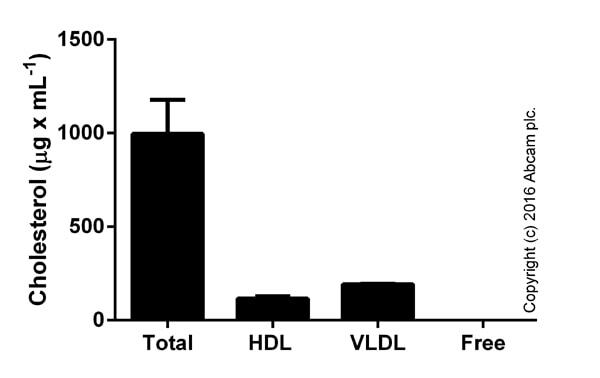 Total Cholesterol (blue), HDL (green), and LDL/VLDL (cream) cholesterol were measured following the kit protocol. This kit offers the possibility of measuring total cholesterol or HDL and LDL/VLDL fractions separately, which is an advantage over having to purchase two different kits. I used this kit to measure total cholesterol from murine plasma samples obtained by cardiac puncture and centrifugation (4 C, 20 min, 2000 g) diluted 1:10 with PBS. The kit was easy to use and precise when the results were compared with historical records. However, when I tried the separation step for HDL and LDL/VLDL fractions, I had the feeling that the design of the kit is not perfect as it is very easy to disturb the pellet and get contamination of your HDL fraction. 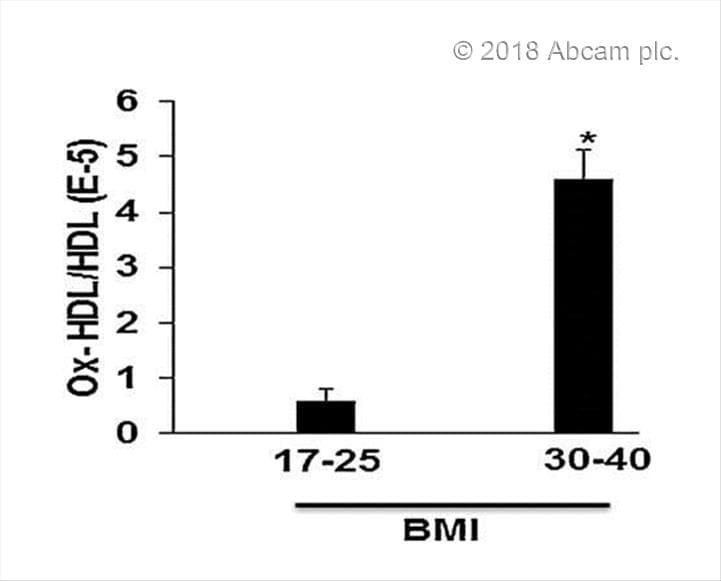 Oxidized HDL is a potent inducer of adipogenesis and causes activation of the Ang-II and 20-HETE systems in human obese females. I used the HDL and LDL/VLDL Cholesterol Assay Kit (Fluorometric) in order to measure total and free cholesterol in zebrafish liver. Overall the assay was successful. I did have some samples outside of the standard curve range meaning I will need to dilute my samples next time I run the assay. I divided all of my standard and sample fluorescence values by a factor of 10,000 prior to developing my standard curve. Attached is an image of my standard curve. 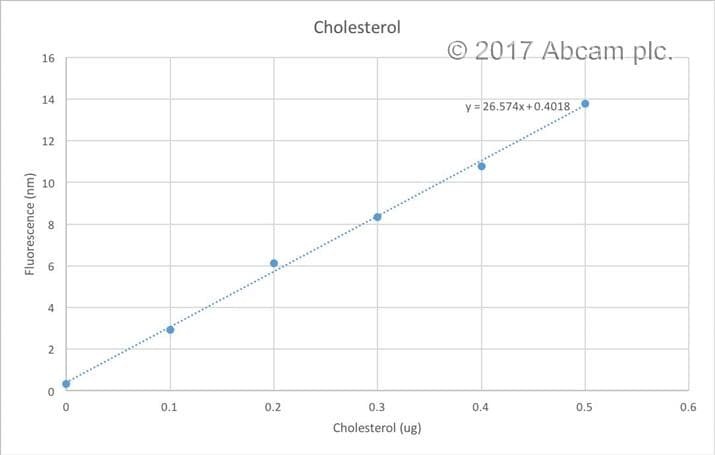 From my standard curve I calculated the concentration of cholesterol that I then applied to the cholesterol concentration equation provided in the protocol. Some example data from my control sample is shown below. I tried 2 extraction methods for mouse liver samples (from ApoE KO mice fed a high fat diet) that had been snap frozen and stored in -80 freezer. 1. Use 0.5% NP-40 in water to homogenize the tissue and then combine with the 2X precipitations buffer. 2. Mix 100 µL of sample with 100 µL of 2X Precipitation Buffer (1:1) in microcentrifuge tubes. 3. Incubate 10 minutes at room temperature. 4. Centrifuge at 2,000 x g (5,000 rpm on a bench-top microcentrifuge) for 10 minutes. 5. Transfer the supernatant into new labeled tubes. This is the HDL fraction. 6. Precipitates contain the LDL/VLDL fraction. To measure the LDL/VLDL fraction, centrifuge the precipitate again at 2,000 x g (5,000 rpm on a bench-top microcentrifuge at RT) for 10 minutes and remove trace amount of HDL supernatant carefully. I tissue homogenate you cannot measure the LDL fraction, only HDL!!!! (In tissue culture it is possibale). 7. Resuspend the precipitate in 200 µL PBS. This is the LDL/VLDL fraction. If the supernatant is cloudy, the sample should be re-centrifuged. If the sample remains cloudy, dilute the sample 1:1 with PBS and repeat the separation procedure from step 2. To homogenise the tissue I used a precellys 24 homogeniser. Overall the protocols were similar but I preferred the Abcam one as all the reagents required are supplied within the kit. The alternative method requires NP-40 which is not supplied which would be expected. From the image uploaded you can see that the 2 methods (Method 1 - Abcam Method 2 - user) produced very similar absorbance values (colorimetic method was used). The samples were diluted 5x to ensure they were within the standard curve. Having compared the 2 methods I will proceed with using the Abcam method. Overall this is a straightforward easy to use kit. 1. Homogenize 10 mg tissue in 200 μl of chloroform:Isopropanol:NP-40 (7:11:0.1) using a micro-homogenizer. 2. Spin the extract 10 minutes at 15,000 x g at RT in a centrifuge. 3. Transfer all of the liquid (organic phase) avoiding the pellet, to a new tube. Air dry the sup at 50°C to remove chloroform for 7min (in a hood). 4. Dissolve dried sup with Cholesterol Assay Buffer (1:1) by vortexing until homogeneous (it is OK if the solution becomes cloudy). Note: The extraction procedure can be scaled up if larger amounts of sample are desired. 1. Use 0.5% NP-40 in water to homogenize the tissue and then combine with the 2X precipitations buffer. 2. Mix 100 µL of sample with 100 µL of 2X Precipitation Buffer (1:1) in microcentrifuge tubes. 3. Incubate 10 minutes at room temperature. 4. Centrifuge at 2,000 x g (5,000 rpm on a bench-top microcentrifuge) for 10 minutes. 5. Transfer the supernatant into new labeled tubes. This is the HDL fraction. 6. Precipitates contain the LDL/VLDL fraction. To measure the LDL/VLDL fraction, centrifuge the precipitate again at 2,000 x g (5,000 rpm on a bench-top microcentrifuge at RT) for 10 minutes and remove trace amount of HDL supernatant carefully. I tissue homogenate you cannot measure the LDL fraction, only HDL!!!! (In tissue culture it is possibale). 7. Resuspend the precipitate in 200 µL PBS. This is the LDL/VLDL fraction. I had no problems using this kit, it worked good on extracted lipids from liver tissue and values comparable to plasma levels. Main limitation is the small amount of cholesterol assay buffer provided which just about fitted 100 samples. But we were aware of this and planned accordingly. We extracted lipids from liver using one of the FAQ questions on the Abcam website related to ab65390 and that seemed to work. 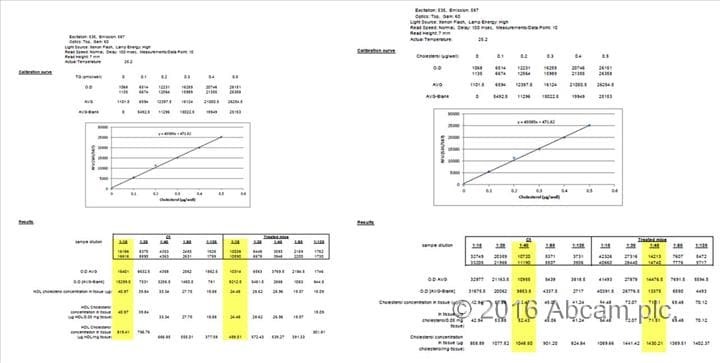 All in all the experiment went good, we opted to assay total cholesterol and HDL only in plasma and liver samples which were 6 months old.